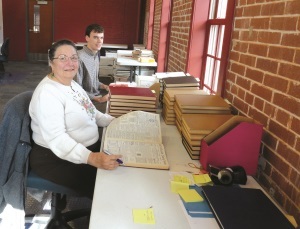 As one of our interns, Michael Wilson, sorted through the published material, he was impressed not just by the depth of the philatelic literature but also by the breadth of the non-philatelic items — from books on the conquest of Mexico and California to Senator George G. Vest’s Famous “Dog Speech.” Michael said he and fellow intern Maria Pavon enjoyed the surprise of never knowing exactly what would greet them in the next box. With 326 boxes to process, that’s a lot of surprises! The inventory of published material is the first step in processing the Alexander donation. This inventory allows the collection to be appraised and enables Michael and Maria to see which materials are needed for the APRL collection. It will also aid professional staff in evaluating the non-philatelic literature. Once this inventory is complete, Michael and Maria will start work on the boxes of unpublished material. With consultation from philatelic experts courtesy of the U.S. Philatelic Classics Society, they will sort this material, place it into archival storage containers for long-term preservation, and prepare a finding aid to assist researchers in learning about and accessing the collection.